Award-winning jewelry designer Robert Pelliccia just earned his 12th American Gem Trade Association (AGTA) Spectrum Award, at this year’s annual natural colored gemstones and cultured pearl jewelry design competition. Pelliccia was honored with third place in the evening wear category for “Opal in the Desert,” a multi-gemstone pendant suspended on a black diamond bead necklace. 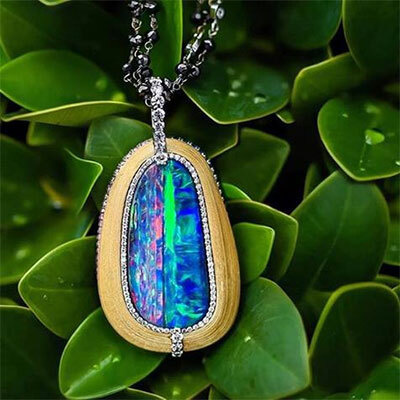 The focal point of the 18kt white and yellow gold piece is a 23.94-carat boulder opal. Blue and pink sapphires, totaling .58ctw, and white diamonds with .92 ctw are also part of the gem of a necklace. Pelliccia discovered the Australian opal while at a gem show with his sister, Ann Marie Dunn, co-owner of J.R Dunn Jewelers in Lighthouse Point, FL, where he is the in-house designer and leader of a creative team. What does a jewelry designer do with a gemstone that clearly inspires awe? If he’s Robert Pelliccia, he designs something that makes the opal really stand out! A thin row of diamonds envelop the opal, and colored sapphire surround the muted 18kt yellow gold that frame the focal point. Pelliccia’s piece is red-carpet-ready and shows a distinct play of color.